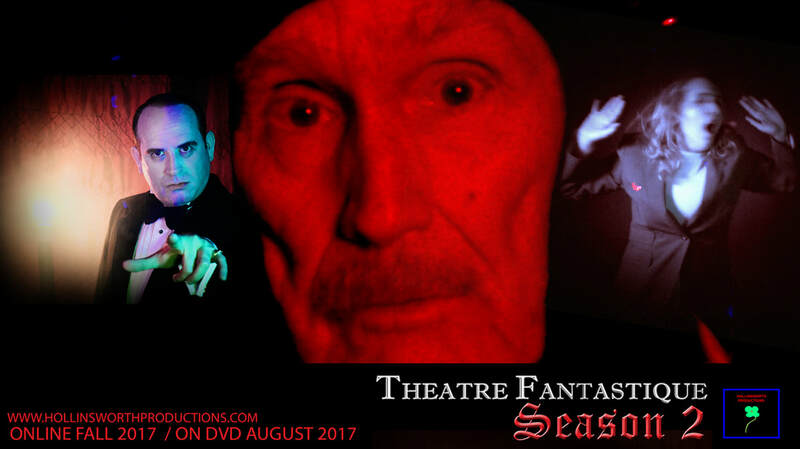 Hollinsworth Productions is excited to announce our very first anthology series “THEATRE FANTASTIQUE” – a brand new online show in the vein of bygone genre shows like THRILLER and NIGHT GALLERY. 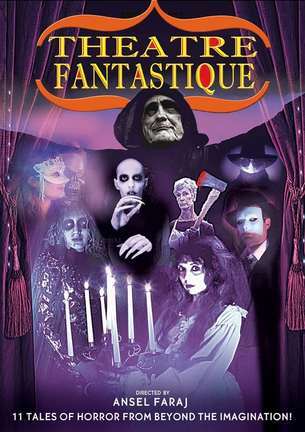 “THEATRE FANTASTIQUE” will revolve around tales of fantasy, mystery, and horror – with adaptations of classic works, and some original tales thrown in for good measure. Each season will be comprised of... five 15 minute episodes, and will appear online over the course of the year. 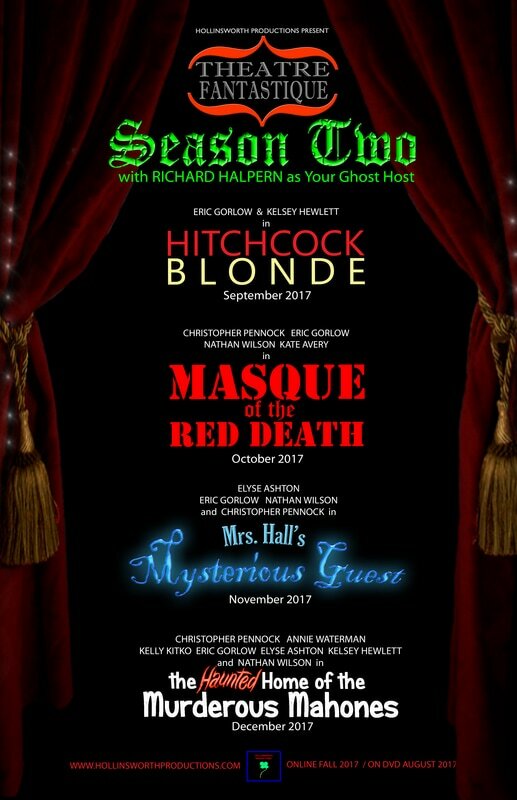 Three additional episodes will also appear, THE HAPPY HOME OF THE MURDEROUS MAHONES - an original dark comedy in August 2014; MADAME LaSOEUR, an homage to late 1960s AIP drive in fare for Halloween 2014; and a final tale THE FAMILY WOLFF, in December 2014. The show will be available to watch online via Hollinsworth Production’s official YouTube Channel. Check out the Hollinsworth Productions website and our Facebook page for more info as it becomes available. December 19, 2014, -- Today, One Year Ago, THEATRE FANTASTIQUE was 'green-lit' for production. It's been a year, and 5 episodes since - and we'd like to take this moment to thank you, our viewers for continuing to watch and support our series. As much as we'd... like to continue bringing you new episodes in 2015, we regret to say that the show will be taking an indefinite hiatus. THEATRE FANTASTIQUE will be returning -- the show must after all, go on. We just don't know when. But when we do, we hope to bring you bigger more elaborate episodes than what we could achieve in our first series. ﻿This ﻿is not the end, no. There are other tricks up our sleeves yet. 2015 brings about a new character to the Hollinsworth Productions universe... a sad old detective named August T. Harrison, and the world and writings of H. P. Lovecraft. Thank you once again for tuning in. 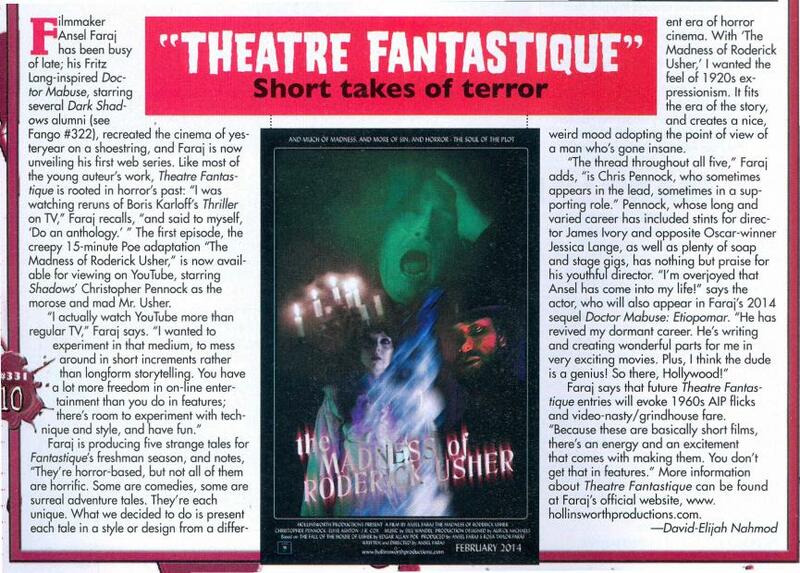 We hope you enjoyed THEATRE FANTASTIQUE: SERIES ONE. 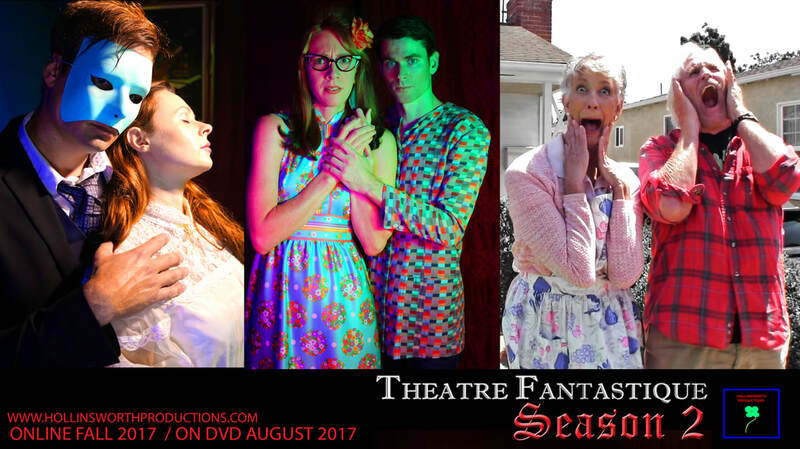 March 16 2017 -- ANNOUNCING SEASON TWO of Hollinsworth Production's THEATRE FANTASTIQUE! 4 new episodes Coming Soon! Returning to perform are Christopher Pennock! Elyse Ashton! Kelsey Hewlett! Annie Waterman! Kelly Erin Decker! Nathan Wilson! Joining the ensemble -- Eric Gorlow! Kate Avery! 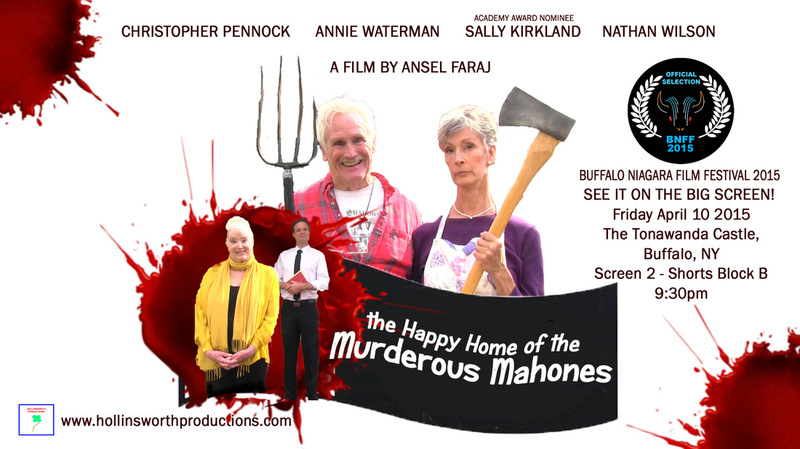 The Murderous Mahones return! Madame LaSoeur returns! 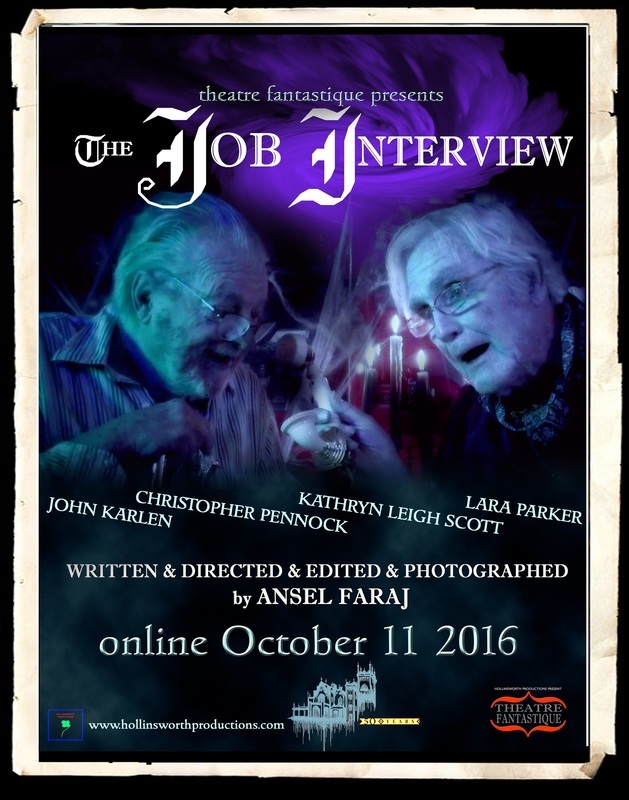 A surreal adaptation of Edgar Allan Poe's THE FALL OF THE HOUSE OF USHER, told from the disturbed point of view of Roderick Usher. A prostitute encounters the legendary vampire Nosferatu. A drifter at sea is picked up by a ghostly ship and gets caught in a violent storm. 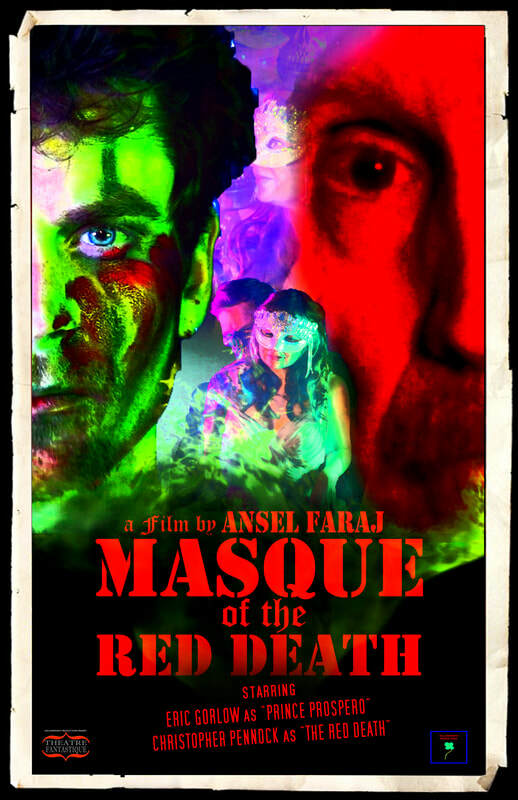 Based on Edgar Allan Poe's short story THE DESCENT INTO THE MAELSTROM. An elderly couple try to kill each other, but accidentally kill an innocent bystander. Now they must cover up the murder, while still plotting to kill each other. In the late 1960s, a man mysteriously vanishes at a séance conducted by the spiritualist Madame LeSoeur - and Dr. Henry Markway must unravel the mystery. Christmas at the Wolff Family household is not your normal Christmas family gathering. A Vampire is hiring a new 'Caretaker', and the right man for the job has come along. A Dark Shadows 50th Anniversary Tribute. World Premiere June 26 2016 at the 50th Anniversary Celebration of Dark Shadows in Tarrytown, NY.